Forgetting that we were going to have more company this week ( this means going out more and eating less meals at home), I bought too many groceries. Between our CSA and my excitement about all the fresh, cheap produce available at the grocery store, I found myself with an excess of perishables. Yesterday I noticed my zucchinis were looking… well wrinkled. 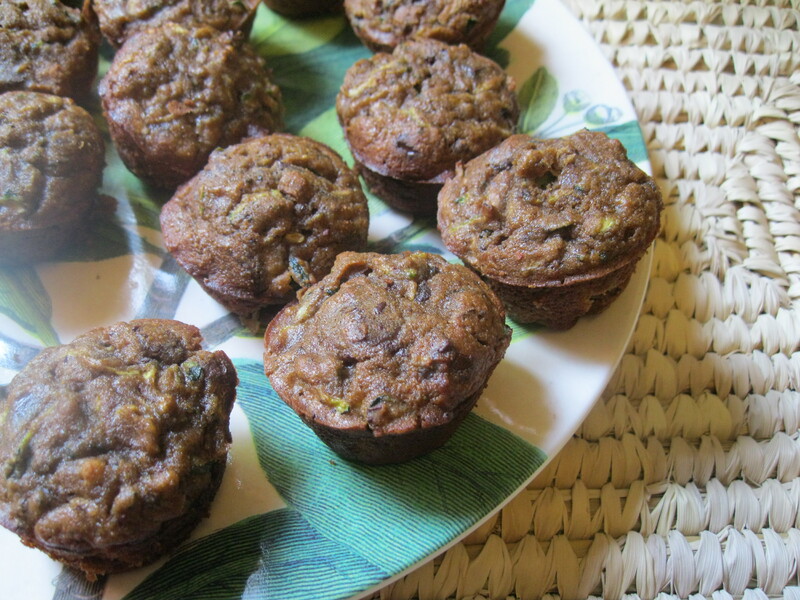 I had hoped to put them on a pizza or stir fry, but decided to take immediate action and turn them into muffins. Chocolate muffins, because I can’t seem to shake the desire for chocolate lately! I came across a recipe on Elana’s site that used coconut flour- a gluten free flour that I bought on impulse and have been trying to become acquainted with. I tweaked the recipe only slightly, and they turned out so good. They are moist (sorry to use the m word, Erica, but they are!) and yet fluffy and not too sweet. The texture is more cake like than muffin like, and I think for a more indulgent treat they would be amazing with frosting or icing, but I haven’t been wanting overly sweet things lately so I left them as is. They taste way better when cooled. I had one warm and it didn’t compare to the cooled ones. Directions: Preheat oven to 350F and grease two mini muffin tins or fill with paper muffin cups. Combine dry ingredients in medium bowl, set aside. Combine wet ingredients in large bowl, slowly beat in dry ingredients, then fold in chocolate chips. Ladle into muffin tins, using a tablespoon for each. Bake 18-22 minutes. Makes about 20.